Santorini, wow. What can I say? A place so small you can see the ocean on both sides of the island when travelling on the local bus. A simple island, where construction includes donkeys carrying heavy materials and wheelbarrows are used everywhere. Cobble stoned walkways so authentic they could break any high heel or roll any drunk ankle. An island filled with the loveliest and most hospitable people you would come across. Where food is so beautifully cooked you force yourself to eat too much so you don't miss out. With views so spectacular you swore you were staring at pictures on Google or straight into a picture book. 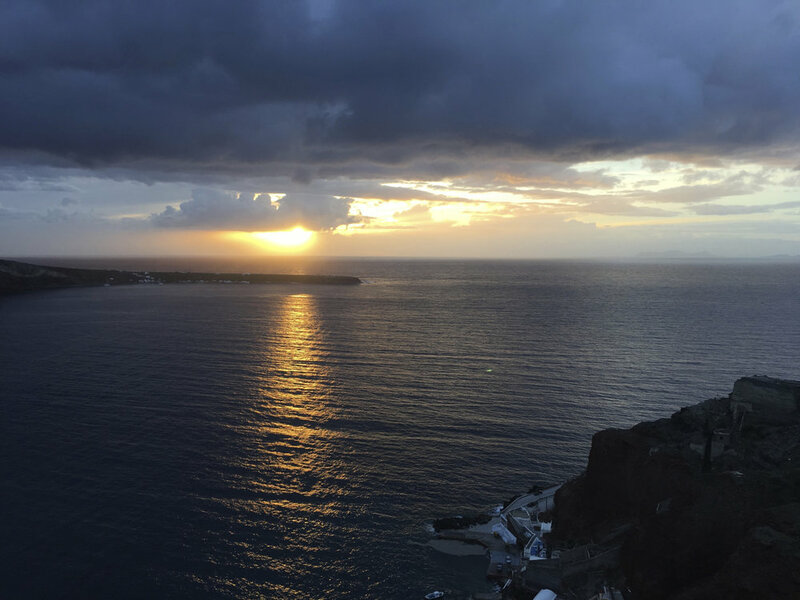 Santorini, the place of beauty and of simple living. I don't know how you can become so accustomed to the views that you go through your day to day without staring out at the ocean for at least 30 minutes each way. I found myself staring out at the ocean taking a moment to be mindful, to pinch myself and realise that I am in Santorini. A place I have only ever seen on post cards and seen online, a place that I still can't believe I have now visited. It has been a long time since I have walked around a place and out loud said "WOW". To walk to a ledge and look at beautiful cliff faces and see the iconic beautiful white and cream houses built on the side of volcanic rock. 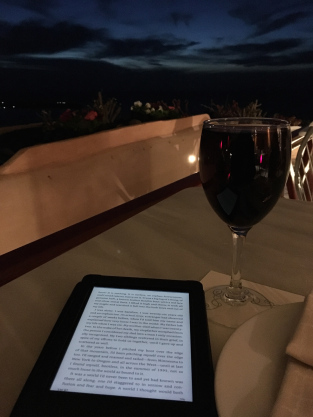 My time wasn't long in Santorini, but for the small size of the island I think three days and three nights were enough for me. 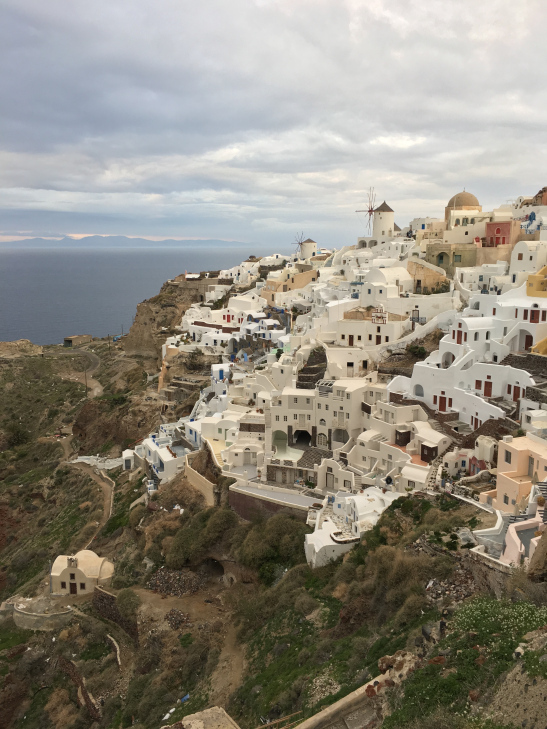 After 44 hours of long haul travel staying in Fira (the main town of Santorini) was the best option. It's only a 10-15minute shuttle ride from the airport. I stayed at Hotel Golden Star which is right in the centre and it served its purpose of giving me a hot shower and a bed to sleep in. Arriving in Santorini and at my room instantly brought back memories of Vietnam where you can't flush toilet paper down the toilet (yup) and you are strongly advised not to drink the tap water. Oh the quirks of coming to such a beautiful place! I seem to manipulate my body well during long haul travel so much so that I had a perfect 8.5 hour sleep. I didn't wake up 2 hours in and lie awake for 4 hours. It was an exhausted and sold sleep. Perfect. 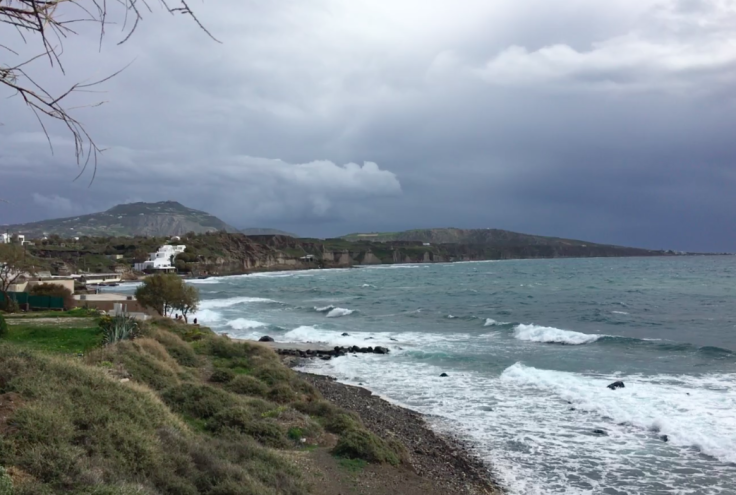 Waking up felt bizarre, I don't think I quite acknowledged the fact that I was in Greece because I arrived to my hotel almost in a delirious state. But I WAS IN GREECE! A place I had always dreamed I would visit and I was finally here. Amazing! I started the day with a delicious Greek Omelette (minus the feta, the waitress looked at my oddly) and a delicious black coffee. Sitting in the square writing, watching the passers by was perfect. 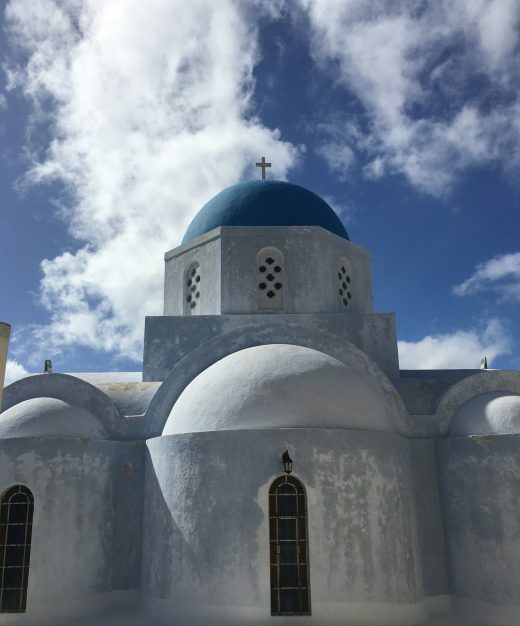 Using only a church steeple as my point of direction, I set off to find one of Santorini's oldest cathedrals. On my way, I walked up and up to stumble on probably the most beautiful views to start any travelling adventure. 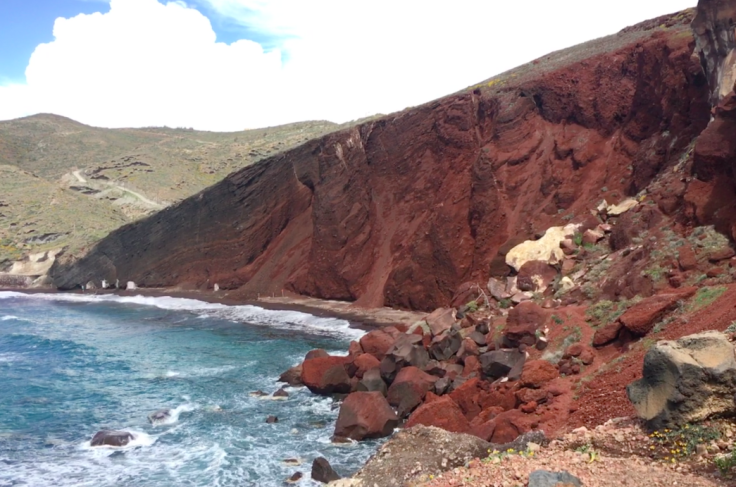 A view off the edge of the island across at the Porto Volcano. I was in awe. Seeing the beautiful white and cream houses and hotels built into the island was just like all pictures had portrayed (picture of the volcano showed above). Absolutely stunning. I wandered only using certain points I could see in the distance as the point I was aiming for, I even wandered into private property after speaking with a labourer when he came to do work and told me I'm in the wrong place. I wandered until I got lost trying to make my way back to my hotel and went on to Oia. Oia - wow. Nothing else to say. Cutest little town. Jaw dropping views off the edge of the cliff. Quieter, not a lot going on with it being off-peak season, but all the better to make it a more intimate experience. These houses are perfectly positioned to the sunset every night! Briam - an authentic bowl of oven cooked vegetables. Not sure how they make something so simple taste out of this world amazing! 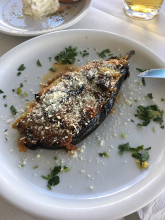 Aubergine Imam - an oven roasted stuffed eggplant with red onion, red peppers, leek, green onion, sprinkled with Feta. Amazing. Pappardelle Asparagus & Sundried Tomato - a pasta with literally three ingredients but tastes like it's made with a cupboard full of items. Devine. And my, oh my, do the Greeks know how to pour a glass of wine! I enjoyed that along with my Papperdelle pasta overlooking the ocean at restaurant Kastro. 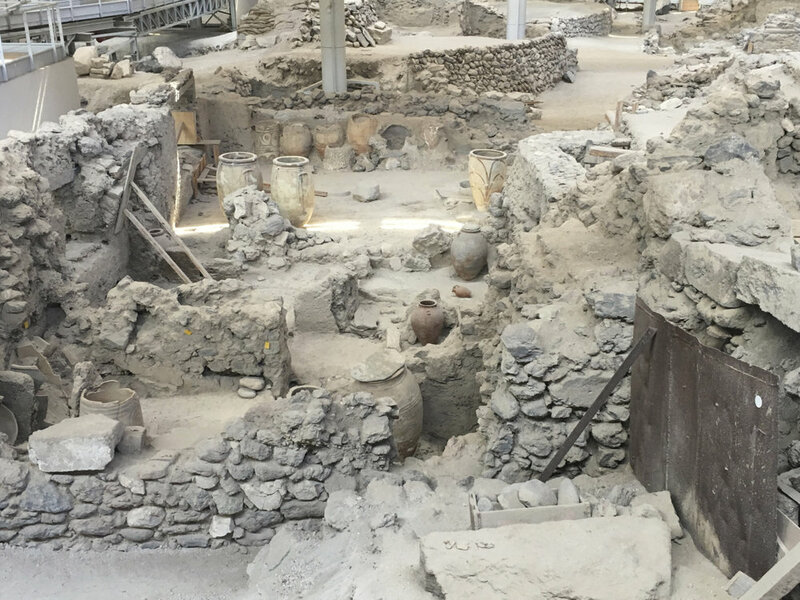 The Red Beach and the Prehistoric town of Akrotiri which was excavated after the 1646 BC Volcanic eruption that devastated the Minoan settlement. Was an amazing site to see! 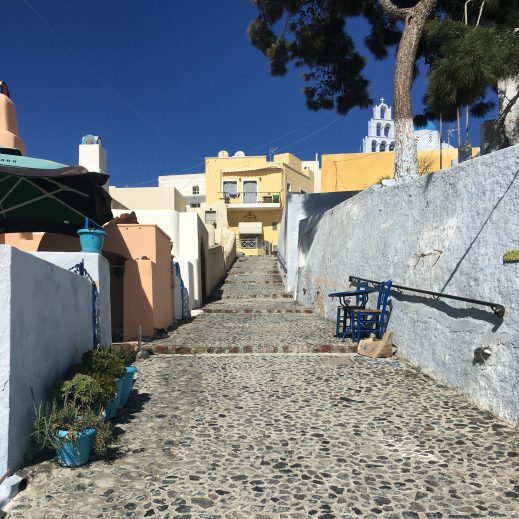 Pyrgos was a quiet little town filled with gobbled pathways leading up to cathedrals. Seems the way Santorini is built. While getting lost amongst the winding walkways, I was continuously taken aback by the beautiful view you could see across Pyrgos. 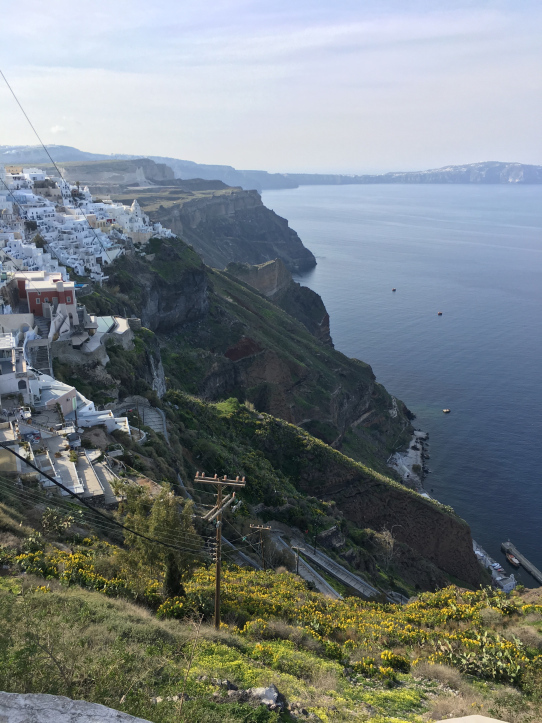 My time in Santorini was short, but a stay with so much beauty and wandering. An island filled with authenticity, simplicity and hospitality. If it's not on your travel list - I would suggest adding it. My final night gave me a small sunset - Oia is known for its sunsets, but due to the unpredictable spring weather, I got a small glimpse on my final night.